When my husband and I go camping, we always take along a small gas grill for cooking because we love to grill out but don't always feel like starting a campfire to cook over. Even though in the debate of grilling: gas vs. charcoal, my husband will always kill for a charcoal grill - it's a little bit too much of a hassle to work with while camping. Who feels like starting a campfire to cook lunch in the middle of a summer day that's in the 80's or 90's? Not me. The first small portable grill we took camping was a charcoal one. It worked well, but after a morning of hiking we were too impatient to wait for the coals to heat up. We had worked up an appetite and wanted to eat right away. Plus there was always the disposal of the charcoal to deal with. It was messy. Then, several years ago we bought a small portable gas grill on clearance at the end of the summer for $20. It heated up fast and was easy to use. The only problem was that we could only get it to cook at one temperature - high! That meant we had to watch our food very carefully and make sure it was completely thawed out before cooking it or we would have meat that was charred on the outside but still raw on the inside. Even though it only lasted a couple of years, it was so cheap it was worth it. We even ended up buying a second gas grill by the same manufacturer because we found it on clearance for even less than we bought the first one for - it was only $15! But, the second one has stopped working as well after only two years. We did get what we paid for - a cheap gas grill. 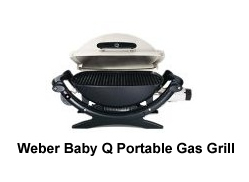 I don't want to get a third cheap gas grill. I'm sick of burnt food. I want a good, reliable portable gas grill that we'll be able to regulate the temperature on, will be easy to clean, and will last more than two years. 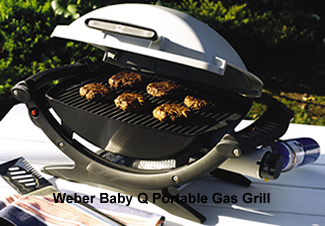 Because I have owned Weber grills for use at home for years, that was the first place I looked to find a good quality portable gas grill. (I currently have a Weber Silver Genesis that I've owned for 7 years. It still works great and looks almost new). 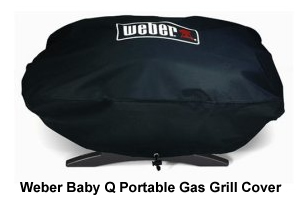 Weber has a portable grill called the Baby Q. On the downside: It weighs 35 pounds which I think is kind of heavy for a portable grill. It's kind of expensive - Amazon currently has it available for $129.00 (the cover is a separate purchase and is currently listed at $7.99). I'm considering purchasing this grill for use on our upcoming camping trip to Devil's Lake State Park in Baraboo Wisconsin (our first camping trip this year) but I'd like to know if anyone owns (or knows someone who does) the Weber Baby Q portable grill and whether or not they like it and thinks it's worth the money. Please share your thoughts in the comment section below.